Einstein in the hood. 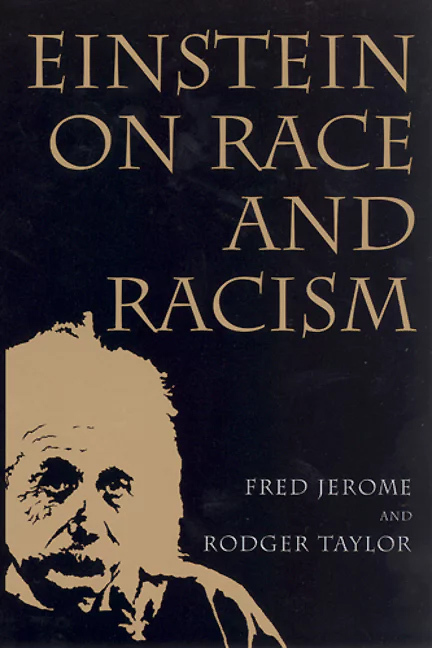 BOOK REVIEW: Einstein on Race and Racism. Albert Einstein (1879-1955) was a Communist sympathizer (Commsymp, in FBI parlance). They also called him a radical, a subversive and what would be called today, a liberal. This according to the dossier kept on his speeches, writings and activities, by J Edgar Hoover. When Einstein left Germany in 1933, Hitler was on his heels. He came to Princeton, N. J., to do research at the Princeton University-financed, but independent, Institute of Advanced Study. Princeton was a southern town in northern gown. Segregation of Blacks from whites was widely practiced and enforced. A majority of the students were from the south and they expected and got a recreation of their home life. Einstein, a German-born Jew and naturalized American citizen, was acutely aware of what racism is and does, and was outraged. But the people of the Black community in Princeton (who outnumbered the whites), especially the children, knew him as this long-white-haired white man who took his daily walk through their Black neighborhood and talked to them. The adults knew he was famous and the children knew he was friendly to them. Princeton was the hometown of Paul Robeson, who by the time Einstein arrived had been long gone. They came to know one another (both of course knew of the other) when Robeson came home to perform. Einstein went backstage to introduce himself. There began a friendship of almost 20 years. Through his writings, letters and articles in the Black press, Einstein made known his opposition to the racism that lived right outside his door. This is the story of an unknown Einstein — the social commentator and activist; the part of Einstein that was almost never reported in the public press, but was well known to social activists and the FBI. He was labeled a Communist sympathizer even as Russia was one of the biggest allies of the United States. Fred Jerome is an Einstein scholar. And Rodger Taylor is an African American historian. They co-authored “Einstein on Race and Racism.” Taylor’s mother told him that she remembered as a little girl running to the window when Mr. Einstein walked down the street, to watch the passing of this famous white man. Einstein talked and walked his opposition to racism that he clearly knew first hand was dangerous to a democracy. He wrote letters, made speeches and sent articles to newspapers. If his socialist activity was reported on at all, it was in the back pages. America has chosen to see Einstein as a pure genius with no interest outside the university. This new and different history of Einstein entails the racial history of America during his time and therefore even more than just what Einstein did then. No matter what stir he was creating at the Institute and at the FBI, Einstein going out for a walk was always an event for the children who walked with and the adults who watched from their porches in Princeton, N.J.